In short, it all seems so ginormous, and it feels like we need to do something huge to change that. …then it’s time to think small. As a whole, thinking small ties in very closely to the topic of progress instead of perfection, and is something I hinted at throughout that post and across the BigSkyRise blog. Thinking small is really about changing our perspective and our approach to things, and in the process giving ourselves a great deal more power, flexibility, and happiness. Before diving into what thinking small really means, and what it is all about, it’s helpful to know what it doesn’t mean. Thinking small doesn’t mean you give up on big ideas, a grand vision, changing the world, or taking an adventurous life journey. Those things can very much live in harmony with thinking small. So, what is thinking small about? In short, thinking small is about small steps, small actions, small changes, and small moments. While each of those components are small, the impact and power of this approach is huge. Actually, while the baby steps concept is related to what I’m referring to, what I’m talking about is actually called kaizen — I really had to make that What about Bob? reference though first. There a number of ways to translate or define kaizen. The simplest is “change for better” which encapsulates the idea progress and improvement. Essentially, in it’s simplest form, kaizen is an approach to getting things done — and an approach to life — where you take small steps to get both small and large things accomplished. As an overall concept, it has been around for a very long time and was touched on frequently by the philosophers and sages of old, and is even among the lessons that can be gleaned from fables like The tortoise and the hare. In the World War II era, it became a bit more codified, making it’s way into the world of production and business in the US under the Training Within Industry program. After the end of WWII, the US brought the concepts of the Training Within Industry program across the Pacific to help restore Japan, and thus “Kaizen” as it is often viewed today was born. Beyond the history and background, what’s really important for us to know, understand, and implement is the way of kaizen, the way of thinking small. Kaizen and the way of thinking small often means we need to retrain and reorient ourselves from our customary mindsets so prevalent in modern society where we look exclusively for disruption, big innovation, instant gratification, overnight success, life hacks, and quick fixes. While there is certainly a time and place for those mindsets, their usefulness and prevalence in the real world are overvalued and oversold at present. This leads to all sorts of issues in our lives, including anxiety, overwhelm, stress, demotivation, and often feelings of failure and inadequacy. With a new mindset based on kaizen and thinking small we can find a remedy for those issues. We take small steps and small actions. We ask ourselves small questions, work toward small changes, and take advantage of small moments. With kaizen, whether you are looking to make large changes in your life, or small ones, look to make the changes you seek through small steps instead of giant leaps. In fact, the key is to find a step that is so easy you cannot fail and then take it. Once there, do that same thing again, repeatedly. Let’s say you can’t get yourself to consistently floss, even though you’ve tried numerous times. Taking the kaizen approach, your goal isn’t to set some form of New Year’s resolution and immediately start flossing every day as you burn up your willpower trying to get through it. That approach will inevitably lead to the same failure you’ve seen before. Instead, using kaizen, you find the simplest, smallest, first step that you’re guaranteed to succeed at. It could be simply flossing one tooth every day, just getting a bit of floss out before you brush your teeth, or even just grabbing the pack of floss before you brush. You determine that first step for yourself, and it doesn’t matter if it sounds or feels silly. The only criteria for selecting a step are that the size of the step is one which you are 100% confident you can take every day, and that it’s a progressive step. Once you’ve decided on it, you take that first step repeatedly. Then when you’re ready, move to another small step that you’re 100% sure you can take every day. So, if your first step was to simply grab the floss pack, your second step might be to get a bit of floss out of the container each time. Then you just keep moving from there. These small steps and actions in kaizen are meant to be so simple and small that it’s no challenge to take them on. The beauty of it is that you are taking steps that don’t feel like much effort at all, and while it may feel counter-intuitive at first, you end up reaching your goal faster, and in a way that is much more likely to last over the long term. Along with the idea of taking small steps, kaizen is also about asking small questions. The scope of the question is minimal in terms of size and time frame, and just like how taking small steps makes the effort feel less, asking small questions makes problems feel less daunting. As a result, this approach helps us overcome the blockages we often encounter in life. For most of us, asking small questions takes a bit of practice since in the same way we are often looking for big leaps to take, we frequently are also asking ourselves very large questions. In reality, this is a fairly big question to ask since losing 30lbs of fat can be quite challenging. We usually know these things don’t actually work, at least for the longer-term. Yet, we still get caught up in them because we feel like we’ve got a big problem that needs a huge solution, right now. This leads us to take actions that lead to failure — or worse — in the long run, even if we have some amount of success in the short term. It’s also possible we may have experienced that failure already — in the case of fat loss that usually results in the endless yo-yo’ing of weight. Essentially, we give up before we even start. These illustrate drawbacks of big leap thinking, and point to a reason why small questions are so powerful, they reorient our mind and they reorient our actions. In the case of our fat loss example, if we find ourselves thinking along the lines of “Man, I sure put on a lot of weight without realizing it. How can I lose these extra 30lbs?” we can then redirect ourselves towards a smaller question. “What is one small thing I can do today to help lessen the amount of weight I’m gaining? Just like with the small steps and actions concept mentioned above, the goal is to ask small enough questions that they are non-threatening, and their potential answers will be 100% achievable for you at that point in time. That means if a question still feels too large, you can always find a way to shrink it down. One way to know if your question is small enough is that the answers and actions found in the response are small enough to be achievable. For example, the question “What is one small thing I can do right now that will help me lose some fat?” may be too big for a person depending on the situation they are in. So, instead, perhaps something along the lines of, “What is one small thing I can do to consume a few less calories today?” will be more helpful. The second question may prompt a response like “I’ll eat five less french fries.” or “I’ll substitute two sips of soda with two sips of water.” whereas the first may have felt like it demanded a bigger action. When it comes to small questions, it is also good to know you may not always find an answer right away and that is okay. There’s an interesting thing with how the brain works when it comes to questions. So, if we ask the same thing enough, our brains start playing behind-the-scenes and begin processing the question and looking for answers in the background. That means in a case where no answers seem to be appearing, just relax, be patient, and repeat the question again the next day. Letting go of our customary set of expectations is an important part of kaizen — and it is also a key skill to develop for living a happier, more fulfilling life. Especially when first getting used to kaizen, it’s important to remember that while the small steps and questions may on occasion seem silly, trivial, or that they will be too slow, given just a bit of time, patience, and a perspective towards progress, the results will be bigger, quicker, and longer lasting than they would otherwise. By acting with small steps and small questions, we avoid stalling out on our journey since we can just reduce the scope of the next step and question until it becomes too easy not to take. If there is doubt on how such small steps, that don’t feel like they really take much effort, can be effective, pause for a moment to consider the evidence that surrounds us. As mentioned in live in the moment… there are so few of them and Change: Get acquainted and motivated, change is an ever present element of life. No matter what we may wish, change is taking place and often on such a subtle level that we don’t notice it as it happens. Usually gaining that 30lbs of weight took a fair amount of time and happened while we weren’t looking, those wrinkles on our faces weren’t formed in just a day, our smoking habit didn’t form after just one cigarette, and usually our credit card debt didn’t come about from one single purchase. Those changes came about due to small actions over a period of time that we usually didn’t even really feel. In the same vein, many positive changes in life happen through small steps. The development of many of our skills and abilities — especially ones we usually take for granted — came about through small steps. For example, our speaking, writing, basic mathematics, walking, running, and other such abilities came about primarily through small incremental steps. The power of compound interest for savings and investment can yield incredible results while the steps involved are small. On a less personal scale, a major element that lead to Toyota being the largest automobile manufacturer by 2012 was its embracing of kaizen. Even accounting for some big breakthroughs, much of the incredible power and functionality of our smartphones, computers, and applications has come about through many small steps. Watching skyscrapers being built, also provides a good example of small steps in action. They go up a piece at a time and are built step-by-step, and in a remarkably quick fashion they significantly alter city skylines. Use the evidence you uncover to realize the effectiveness of the kaizen approach, and at the same time keep faith in your own potential for unlimited and continual improvement. A key to getting the most out of kaizen is to understand it isn’t just a one-off hack, it’s much more of a lifestyle. To really wield it’s power it’s important to see kaizen as an ever-present and ongoing way of doing things. By consistently asking small questions and taking small steps, instead of stopping or looking for a big leap after the first step or two, continual — and substantial — progress is made. The great thing about this small step approach is that it works throughout the various areas of life. Kaizen can be applied to health, wealth, business, careers, relationships, spiritual growth, and more. The majority of what we interact with in life is best handled with this small question and small step approach. This allows us to learn more, make progress without fear, be more open, and tackle things that might otherwise seem insurmountable. Additionally, it leads us to build more confidence, and just like when we learned to walk, we gradually can make our small steps just a bit bigger and then start to run. Of course, there will always be a place for big leaps too, and sometimes you’ll find you just need to jump. An often unseen benefit of approaching life with a greater emphasis on the kaizen way is that it helps make those points for leaping more apparent, while also allowing for greater progress and confidence across the board. Plus, when it does come time to make a leap, you’ll be and and feel much more prepared for it. In order to reap the benefits of kaizen, you’ll need to take it from abstract concept and turn it into concrete action. Action is where the magic happens, and through action you wield the power to change your life. The great thing is that you can take kaizen from concept to action with a kaizen-based approach; asking small questions on how you can benefit from it, and taking small steps to start making progress in using it. 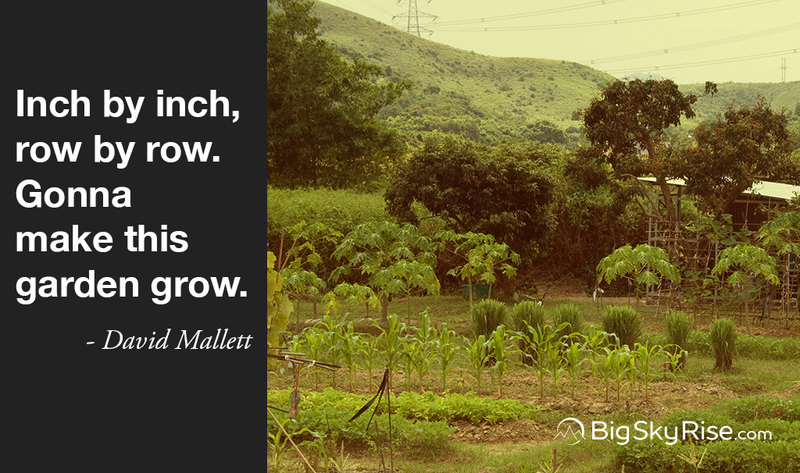 Whether you want to make big or small changes in life, it’s time start thinking small. Specifically, it’s time to start thinking about small questions and small steps. From there, it’s time to start taking small actions and to live the kaizen lifestyle. While it may seem counter-intuitive at first, the quickest and easiest way to make big changes is to think and act small. You’ll be able to overcome fear, overwhelm, past failures, and more to achieve things you might think are impossible. All it takes is a small shift in perspective and thinking. In most situations, small questions and small steps lead to greater and quicker progress than the conventional big leap, big change approach. Look for the smallest ways to make progress and improve things. Ask yourself how you can use kaizen in your life now.